At the end of a season or holiday, I always have a pile of paper scraps on my craft table. Sometimes I just separate the solids from the prints, ziploc bag them, and put them into my scrap bins. 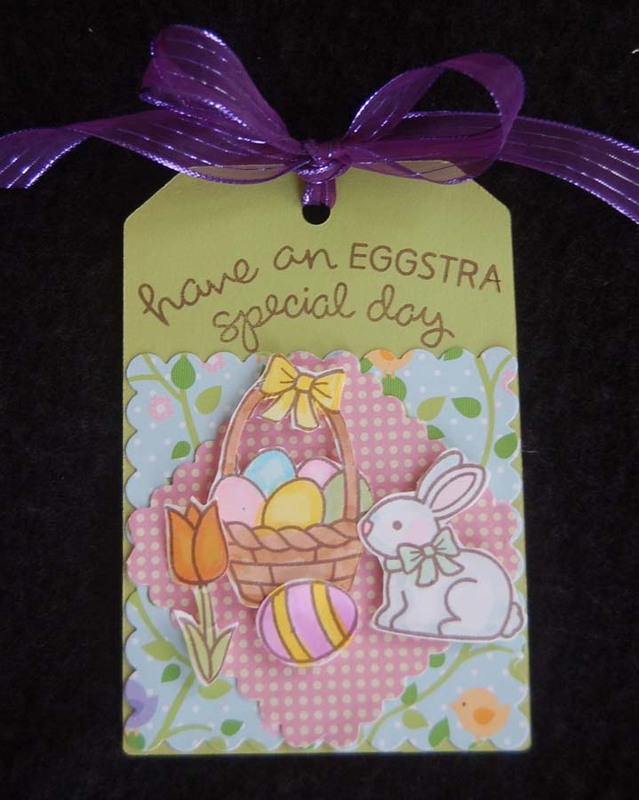 Sometimes when I just haven't had enough time to 'play' with my seasonal craft 'toys', I try to use up as much as I can by making tags. Here are some the results of my 'playtime'. 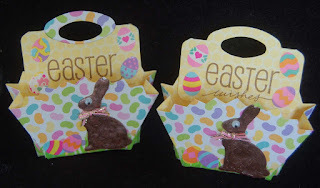 Since it is after Easter, these will go into my ziploc bag of springtime tags and hung up (on hooks). 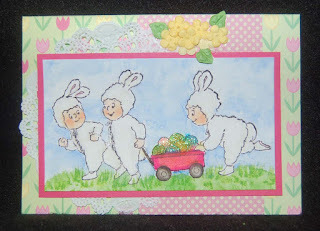 When next Easter rolls around (and it does come fast), I will have bunny hop start on the season. I enjoy knowing that I have a stash of tags ready to attach to a bag of goodies. Life is busy...be ready! The papers I used were from my stash and included one that had words which matched the image...amazing! 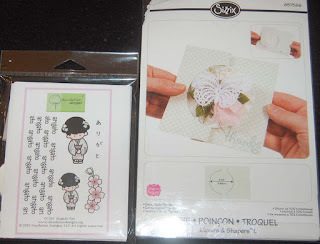 The dotted card stock came from a Studio G pack (sold at BFC for only $1.50! 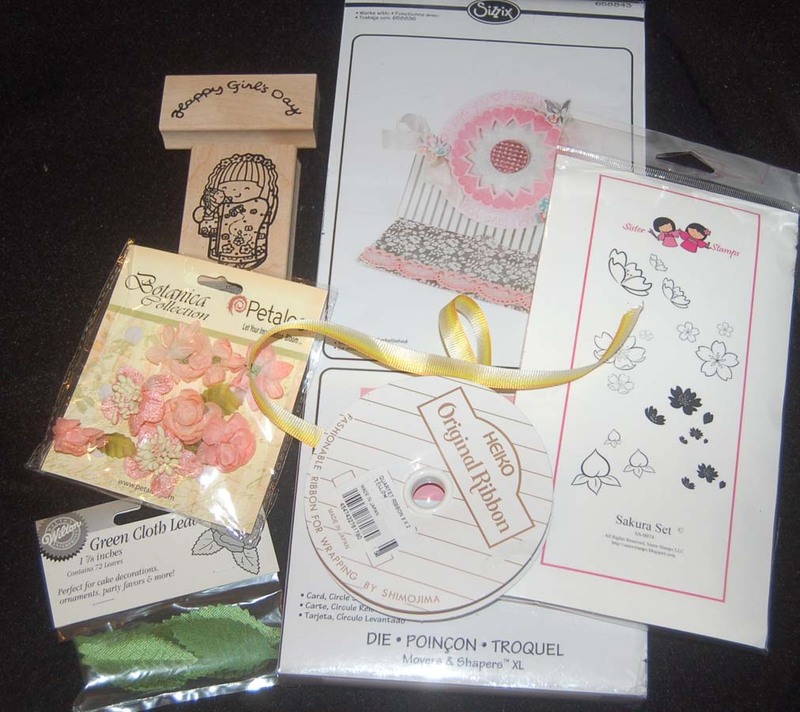 ).The ribbons and Prima flowers (old stash) were also from Ben Franklin Crafts. 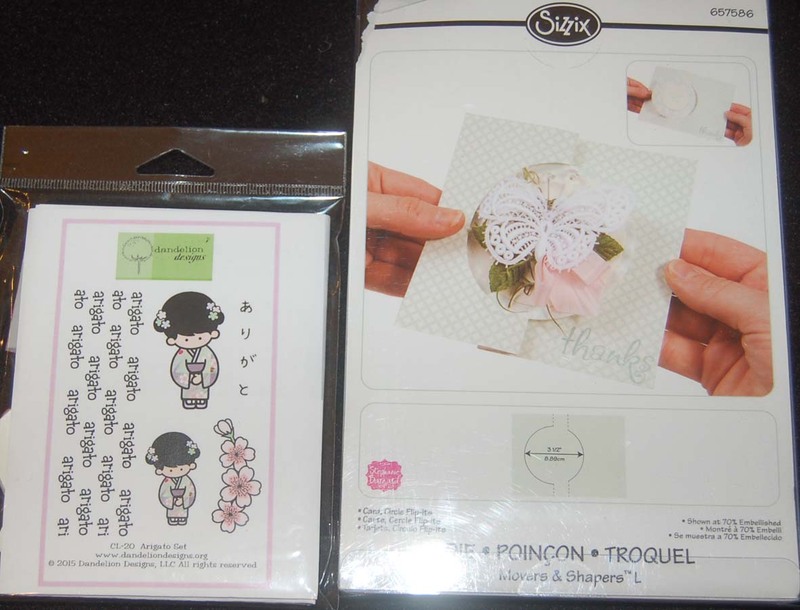 I bought the mini Perfect Layers ruler and cutting mat a while ago but only recently realized how it simplifies a task (cutting thin borders on layers of papers) that I normally find tedious. I guess I'm a slow learner or resistant to change. LOL! Anyway, thanks for visiting and have a very Happy Easter! 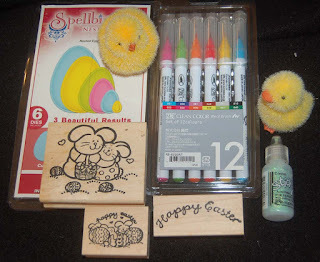 If you are not too busy dyeing and hunting Easter eggs, leave a comment....love hearing from you! 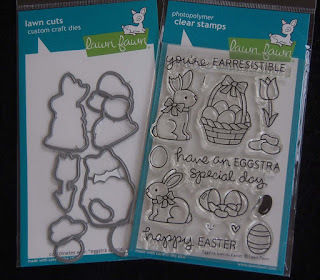 I've been thinking about making special egg-shaped shortbread cookies decorated with royal icing. 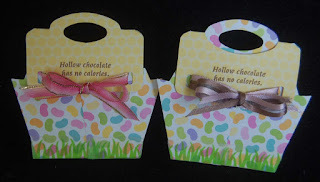 Since they will need special cookie holders (so hard to make that everyone gets only one...heehee! 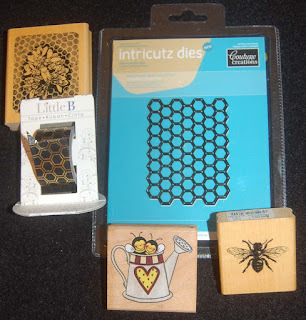 ), I started looking through my collection of dies to see which one would be perfect. The Sizzix cookie pocket die seemed okay, but I really wanted a basket shape. 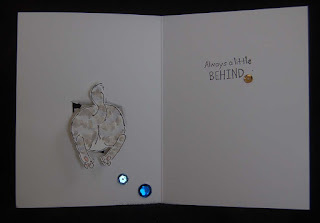 In a light-bulb moment I thought to combine one of the Sizzix treat topper dies with the pocket die and I really liked the combination. 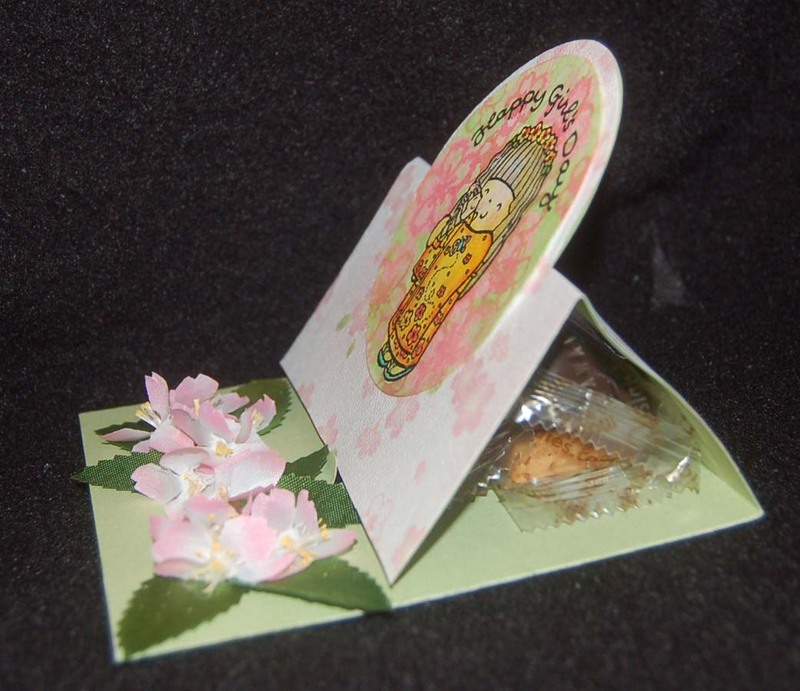 The cookie pocket has just enough space for one huge cookie and the handle of the topper allows for a tag to be attached. 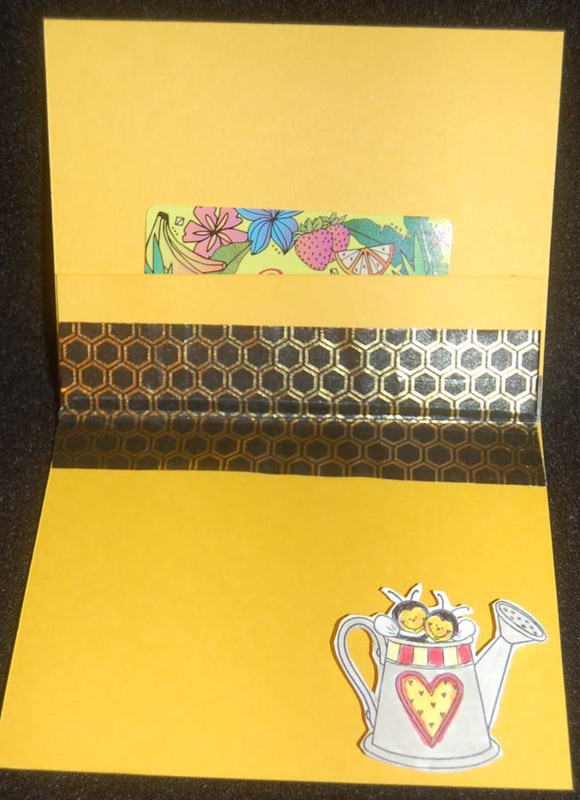 As you can see the topper can be adhered so that only the back of the two sided card stock shows in the front or you can reverse it and let the colorful print show. 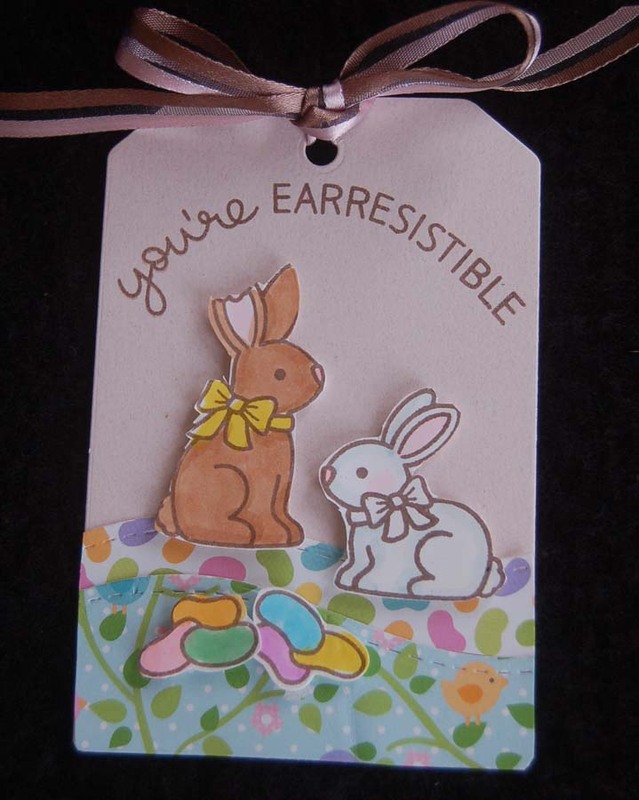 The 'chocolate bunnies were die cut with the Tim Holtz die...one of my favorites...and covered with Bo Bunny Chocolate pearlescent paint. I think the google eyes and tiny Heiko ribbon (from Celebrations) add just the right whimsical touch. The egg stickers are Mrs. Grossman's and the decorative double sided card stock is a Doodlebug Designs product. Both were purchased a long time ago from Ben Franklin Crafts....hoarded Easter emblishments always come in handy. The message, 'hollow chocolate has no calories' on the back of the holders always makes me smile. I purchased the stamp from Las Vegas Stamps and the Easter wishes stamp is a Studio G one from BFC. Oh yes, the grass is applied Doodlebug Designs washi tape...a wonderfully useful product from HM Ben Franklin Crafts. This project came out better than I imagined so I was glad that I decided to rummage through my craft supplies to find just the right items. Now I just need to bake and decorate the cookies....hmmm...should I cave and use Big Island Cookies? 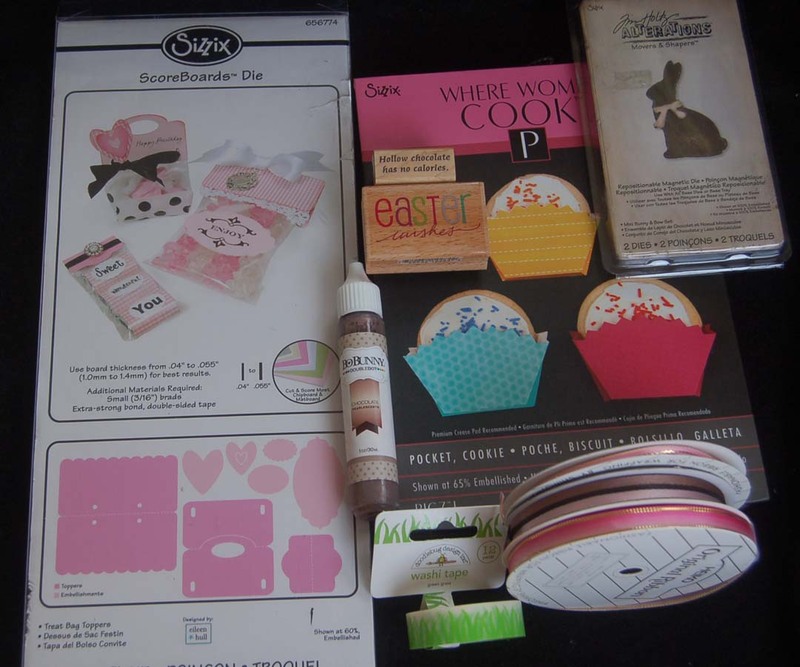 Have a sweet crafting experience! I really like shakers and slowly I've been perfecting my technique so that the confetti doesn't stick to the edges of the card or tag. The Spellbinders egg die set seemed like a good choice for egg-shaped shaker tags. First I cut out two egg shapes. For the top one I used the next smallest size die and cut out an inner opening. 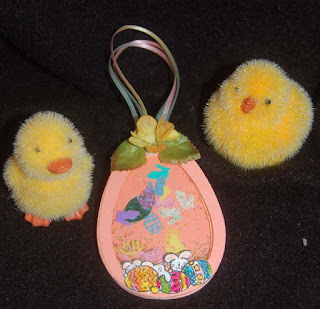 I also cut two egg shaped rings from thin salmon-colored foam (from Ben Franklin Crafts). After cutting out a large egg shape from a piece of acetate, I glued all the pieces together with Beacon 3 in 1 glue in this order...card stock egg ring, acetate and foam egg rings. 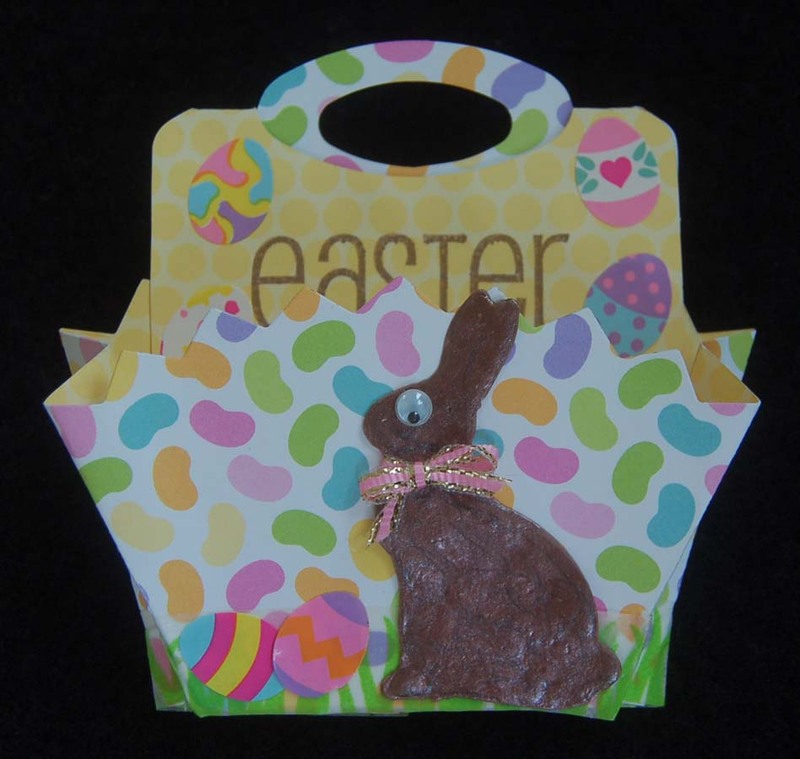 Then I filled in the cavity with shaped confetti (purchased from BFC during past Easter seasons). 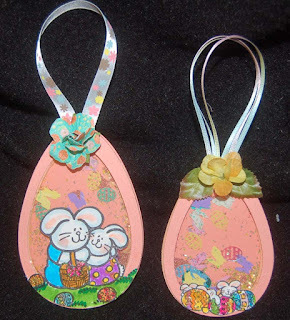 The final step was to glue on the back card stock egg. 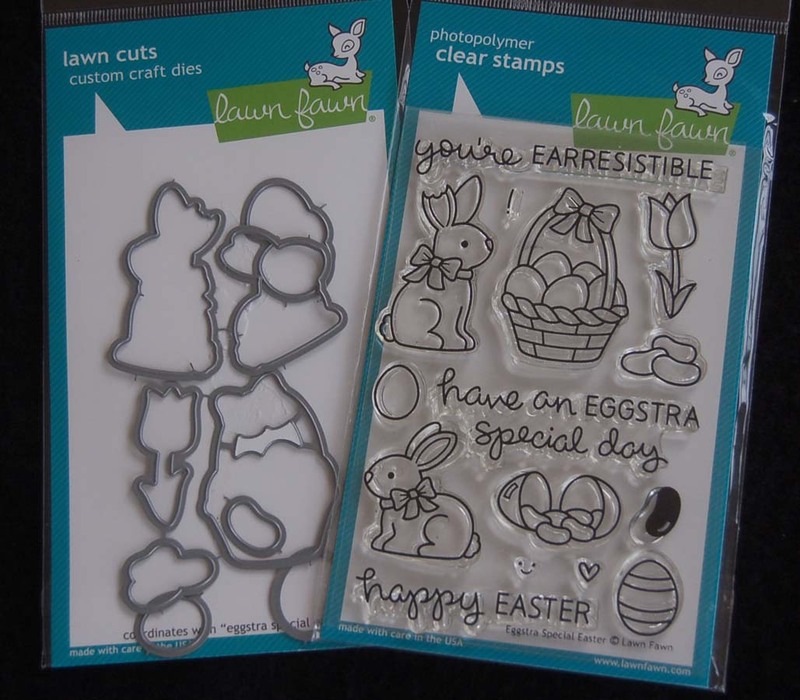 Taj stamps (from Ward Warehouse Taj Clubhouse) images were used for both eggs and the colored egg images were sparkled up with Stickles clear. 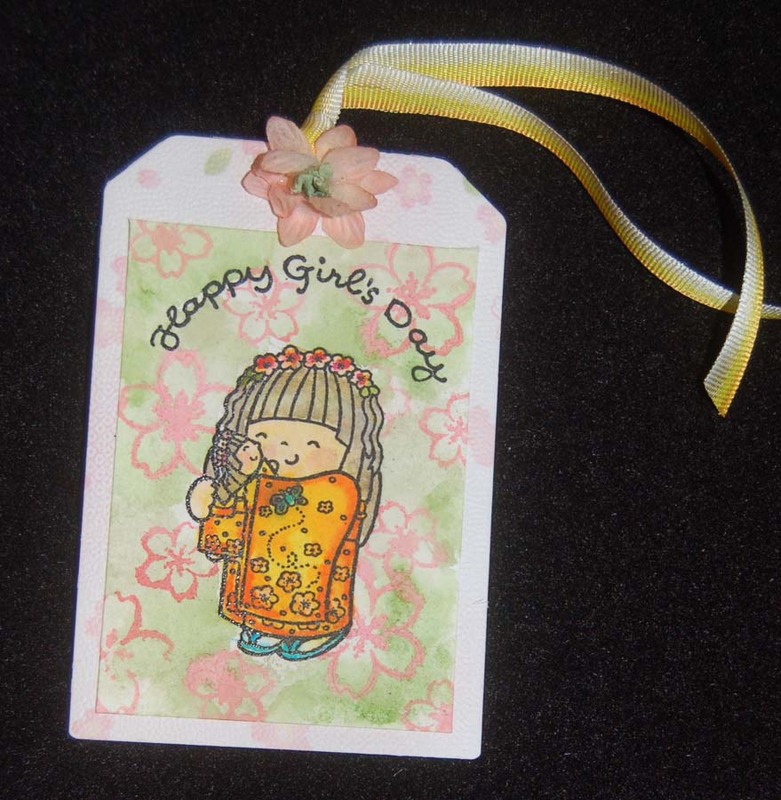 This smaller tag was made from the inner pieces that were die cut from the larger tag. 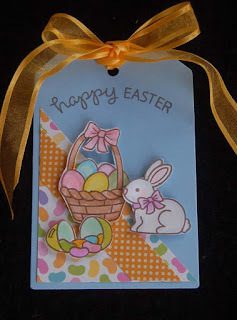 I still can make yet another smaller tag with the leftover inner egg of this smaller tag. Zig Clean Color brush markers (from BFC) were used to color the images. 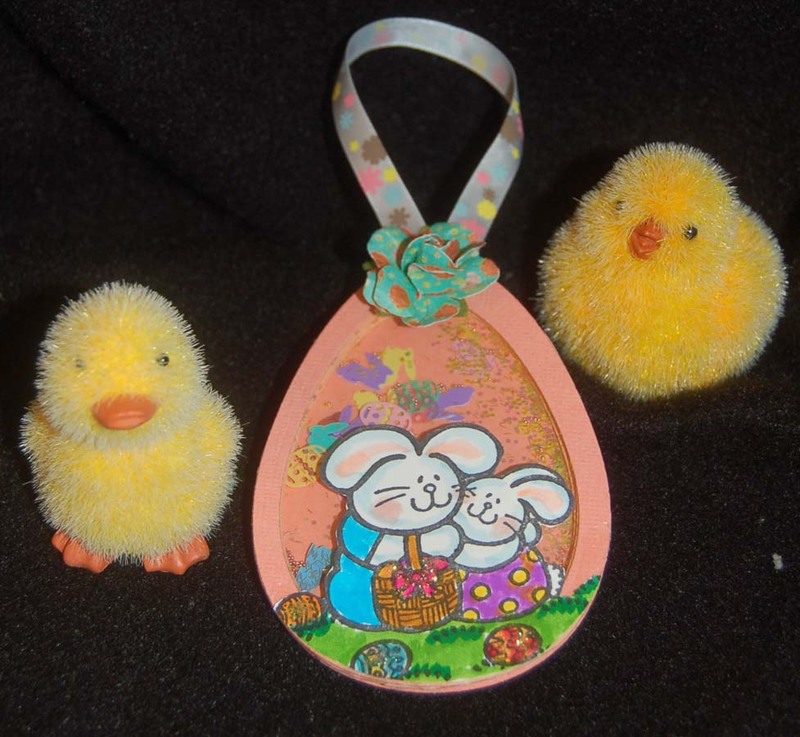 Don't you just love the little furry chick and duck? I discovered them at HM Ben Franklin Crafts and couldn't resist getting a couple. They will look adorable in an Easter basket or on the Easter brunch table, Hope you are looking forward to a special Easter celebration. Enjoy! 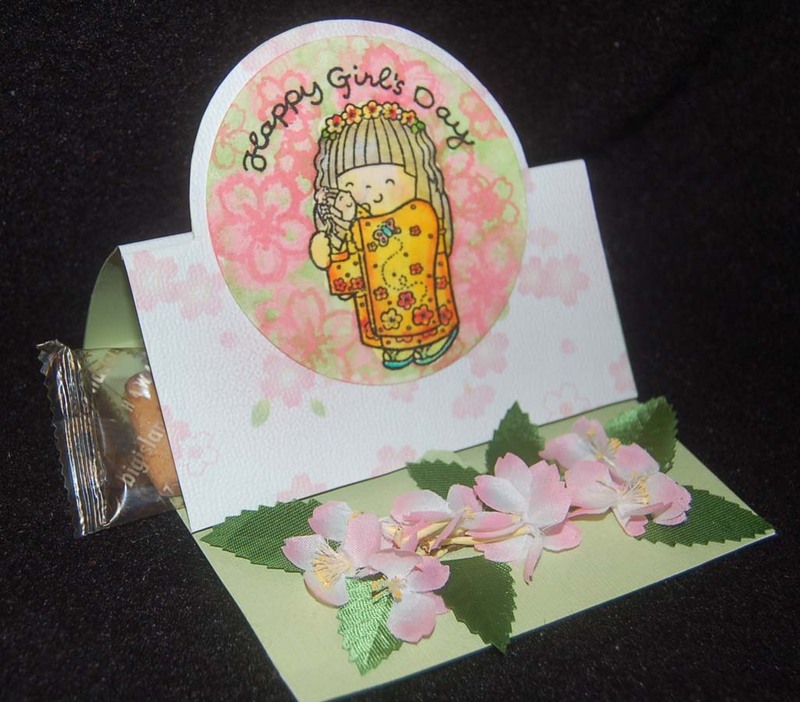 This simple card was made using an old Sizzix die (the thick heavy kind). 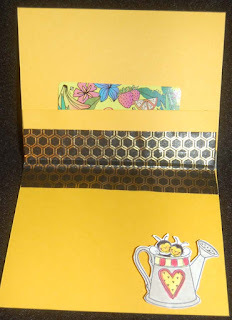 Because I couldn't find just the right Asian-looking card stock, I sprayed (Elmer's Spray Adhesive) on a card stock and adhered two different Japanese printed paper (from HM Ben Franklin Crafts) to both sides of the card stock before cutting it with the Sizzix die. The inner circle is a die cut watercolor paper piece that was stamped with the girl image (Dandelion Designs), colored in and then painted with masking fluid. Once the fluid was dry, I spritzed the circle with water and applied green watercolor paint before stamping with a cherry blossom stamp inked with Distress ink. 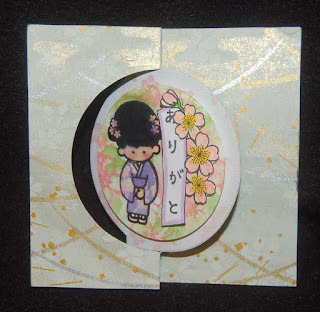 The kimono was paper pieced and the Japanese characters plus stamped, colored flowers were adhered with foam dots. 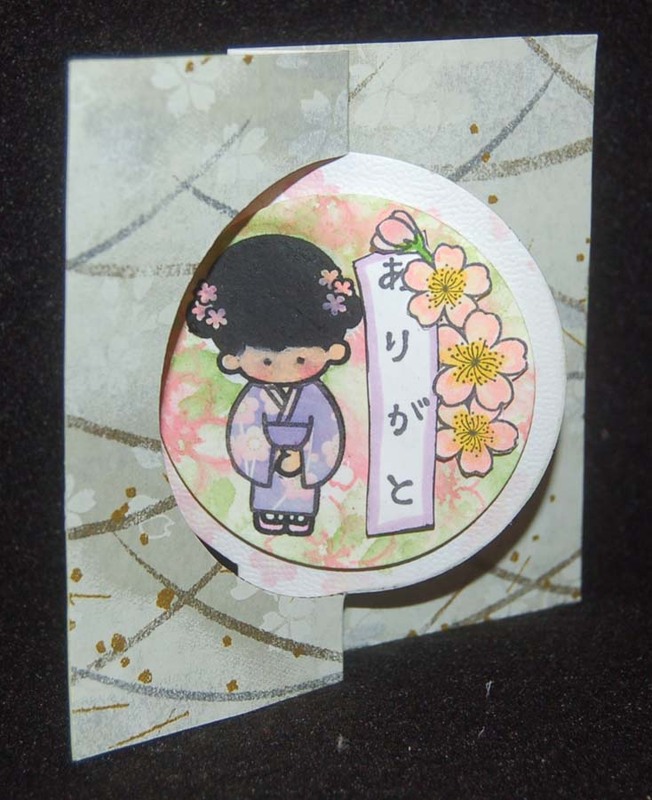 Since this card is going to someone who can read the 'arigato' Japanese characters, I didn't need to include an English translation, but a simple 'thank you' die cut could easily be added to the card. 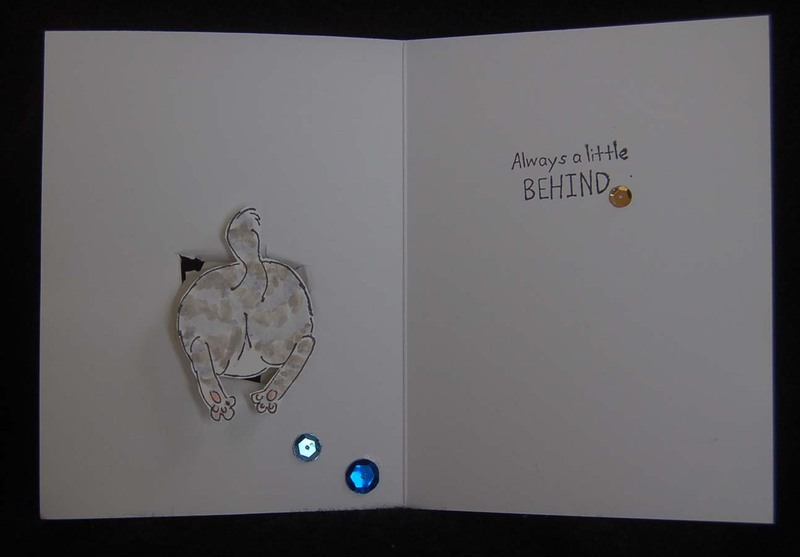 The back of the card has ample room to write a sincere thank you message for the well-chosen birthday gift I received. With the prevalent use of text messages, very few people send 'real' thank you notes but I really would love it if the courtesy of a handwritten gratitude would return. I guess I'm just an old fashioned dreamer living in an age of impersonal electronic devices. 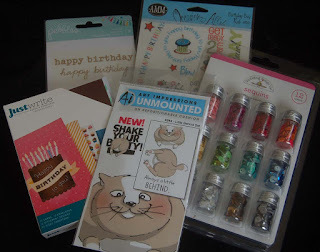 Usually, I am very good about getting birthday cards and gifts to the recipient in a timely fashion, but sometimes there are unforeseen circumstances. I was going to give the birthday girl something that she admired in My Locker Box (Hilo) but when I returned to get it....it had sold! Oh well, I could make another one except that the pendant was a one-of-a-kind. Finally, I located another similarly carved pendant, but then I couldn't find the cording. Where did I put the roll? Despite all these set backs, I am confident that I will finish the gift before the end of 2016. LOL! 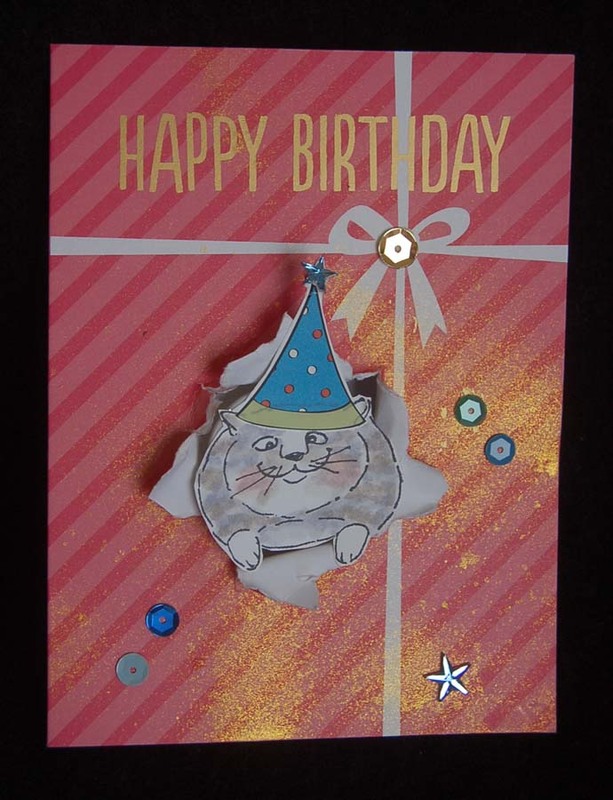 The gold 'happy birthday' letters were Pebbles rub-ons and the cat's party hat was rubbed on before cutting the feline out. 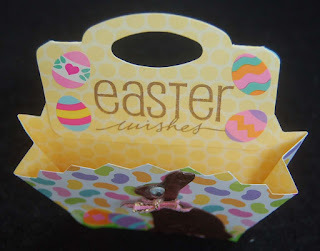 Some of the sequins came from the Doodlebug Designs set of 12 colors and I like the way they add just a little bling. Also the sequins and gold mist spray help to cover a few boo-boos...LOL! 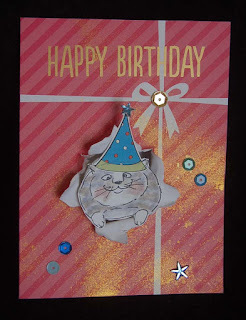 This card came together very quickly because of the pre-made card and rub-on elements which is a good thing or I would be even later mailing out the gift. That's it for today....got lots of other projects that need to be completed. Thanks for stopping by! 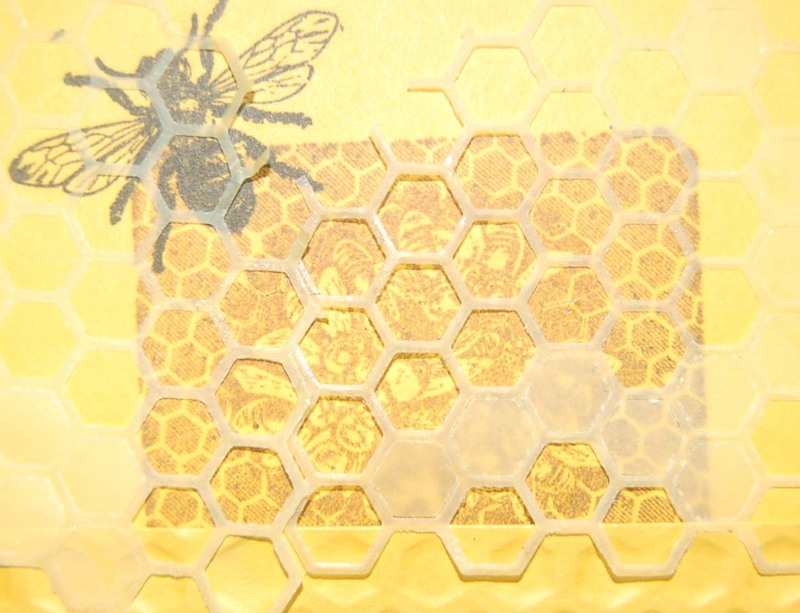 As a proud contributor to the Adopt-a- Beehive program sponsored by UHH and Alan Wong, I am happy to say that there is a bee hive in Hilo with my name on it. That's why I am bee happy! 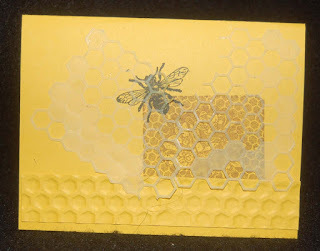 Besides helping deserving students acquire scholarships, I get honey from my hive mailed to my home. 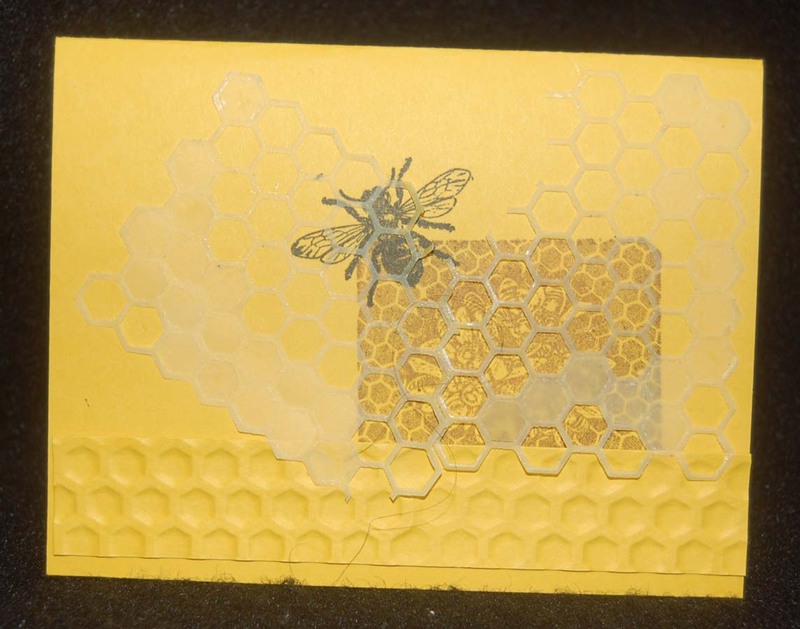 As a special thank you to the student who is caring for my prolific hive, I decided to send this card and enclose a gift card. 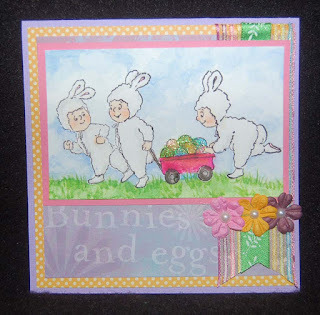 This project was inspired by a cute stamp I purchased from Taj clubhouse at Ward Warehouse. (The word stamp was from there, too.) I decided to practice my masking and watercolored background techniques. After stamping in black, I colored the image in before masking it with liquid mask. Once the mask was dry, I had fun spraying the watercolor paper circle with water and dabbing on some green watercolor paint. 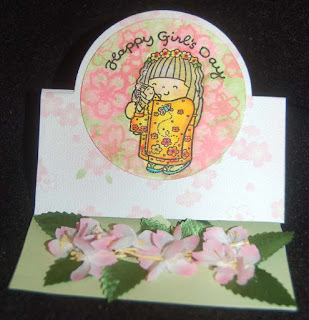 Before it all dried I stamped the Sister Stamps cherry blossoms with pink Distress ink. I think this Girl's Day treat holder would be a fun thing to leave on a co-worker's desk. Three Big Island Candies shortbread cookies fit nicely in the hidden space. I think a small candy bar is another option. 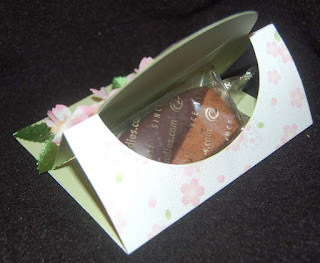 Once your gift treats are eaten, the holder is a nice place to hide additional goodies for that late afternoon energy boost. I didn't have the right printed card stock so I used Elmer's Spray Adhesive (from Ben Franklin Crafts) on some Japanese paper (lots to choose from at BFC) and adhered it to green card stock before using the Sizzix die to cut out the stand up card (now treat holder). As usual I had some extra practice pieces leftover which I couldn't waste so I turned them into a tag. I used the Little B tag die from the set to cut the large tag. 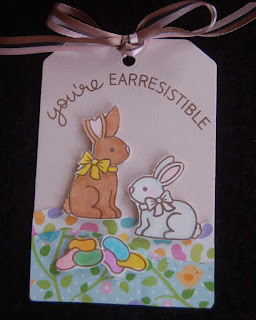 I think I like the watercolored background on this tag better than the one on the treat holder. For this tag I used a Petaloo flower but the treat holder is decorated with cherry blossoms purchased in Japan.....BFC does have some in the floral department. The Wilton leaves were purchased in the cake decorating section of HM Ben Franklin Crafts. The yellow ombre Heiko ribbon is from Celebrations where they have lots of pretty colors of soft ombre ribbons. I hope your Girl's Day is sweet and pretty! Enjoy the start of spring! 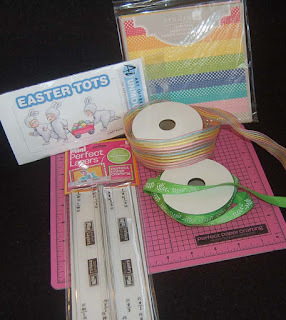 Easter crafting begins!